Despite England’s disappointment, the 2008 Rugby League World Cup in Australia wasn’t all bad. Far from it. For one thing it allowed best-selling sportswriter & broadcaster Dave Hadfield to gather material for Down & Under, his long-awaited follow-up to Up & Over – in which a journey through England’s rugby league land was chronicled. 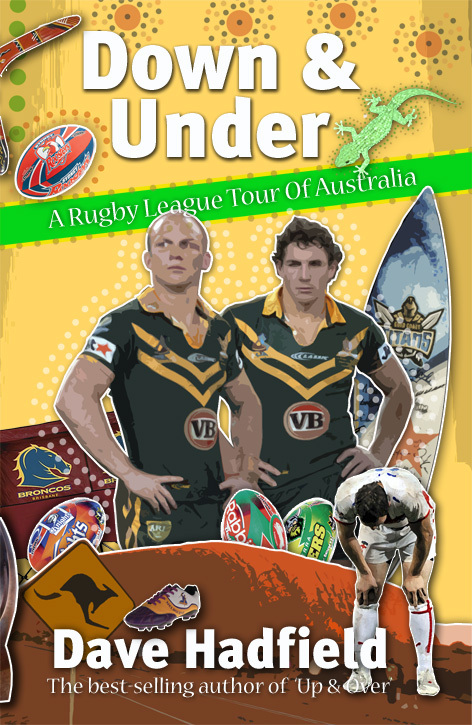 This time, the glamorous world of Australian rugby league comes under the microscope as Hadfield unleashes his wit, wisdom and wanderlust on the land of Ned Kelly and Wally Lewis. A great read? You betcha! Paperback, 216 pages. Down and Under reviewed in the Independent – Sunday 14 February 2010 By Simon Redfern When it comes to World Cups, rugby league has a long way to go before it can compete with the football equivalent in capturing the imagination of the British public. But the 13-a-side version has its charms, especially if you approach it with an open mind and a well-developed thirst, as did Dave Hadfield of this parish when attending the 2008 tournament in Australia. While events on the pitch get due mention, the real charm lies in Hadfield’s Bill Brysonesque take on the people and places he encounters along the way. His mantra is “Don’t let the rugby spoil the trip,” which is just as well given England’s dismal performances, and he clearly loves Oz. Whether discoursing on the fine distinctions between hoons, larrikins and bogans in the pantheon of Australian layabouts or musing on the country’s unique beer measures, he is an amusing companion, the kind of bloke you’d actively seek out in a pub rather than avoid. Cheers for the book, Dave; the next schooner of grog is on me. 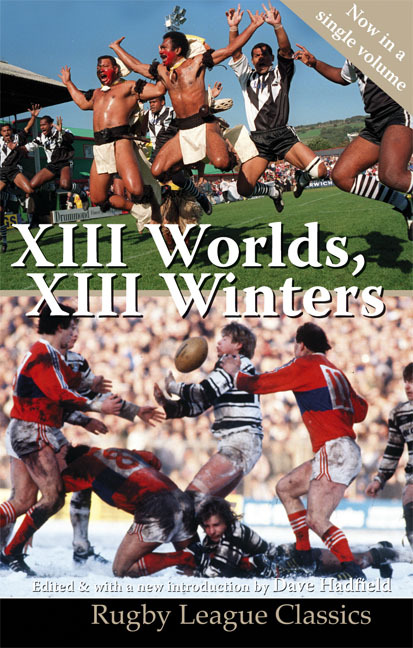 The fourth in Scratching Shed’s Rugby League Classics series and published in a single volume for the very first time, XIII Worlds, XIII Winters represents a high-water mark in the development of quality rugby league literature. The book comes complete with a brand new introduction, penned by its editor, the renowned rugby league writer, journalist and broadcaster Dave Hadfield. Paperback, 496 pages. Free postage & packing. The idea for XIII Winters, as its editor, Dave Hadfield, freely admitted upon its original publication, was pinched from Nick Hornby’s My Favourite Year – with which it had one contributor in common. Hornby’s tome was a collection of essays by writers and fans about a favourite year following their favourite football team. In XIII Winters, Dave Hadfield set out to do the very same thing with rugby league and succeeded absolutely. Published by Mainstream in association with Open Rugby magazine, XIII Winters boasted chapters by the likes of Harry Edgar, Martin and Simon Kelner, Huw Richards, and the soon-to-be Rugby Football League boss Neil Tunnicliffe, among others. Its writers may not have realised it at the time but, in the mid-1990s, when a switch to summer was just around the corner, rugby league’s long-standing association with the depths of the English winter would soon be lost, presumably forever. Indeed, such was the chord struck by XIII Winters that Hadfield & Co followed it up with XIII Worlds, an equally lively celebration of rugby league’s often maligned international dimension. Although not as big a seller as its predecessor, subsequent events and the passing of the years have rendered this entertaining, witty and often overlooked collection worthy of reappraisal. So here they are – brought together for the first time in a single volume as part of the Rugby League Classics series. Complete with a brand new introduction, penned by Dave Hadfield himself, XIII Worlds, XIII Winters represents a clear high-water mark in the development of quality rugby league literature. Eric Ashton was the epitome of a rugby league hero. Had he bestridden the American Wild West rather than the mean Lancastrian streets of Wigan and St Helens – those deadly rival towns whom he managed otherwise to unite in mutual respect for his sporting prowess – the lean, tall and taciturn Ashton would have made the ideal gunslinger. 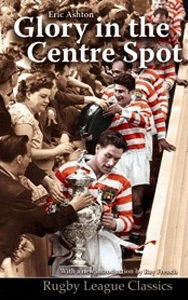 Glory In The Centre Spot is his autobiography, first published in 1966 and until now long out of print, rebranded as the third book in Scratching Shed’s Rugby League Classics series. Paperback, 216 pages. A gentleman to his bootstraps, Eric Ashton was renowned for fighting fair and with flair. Blessed with matinee idol looks, he despatched opponents with consumate and deadly skill; in his case via a perfectly-judged hand-off or bewildering scissor-move pass. In Glory In The Centre Spot, his autobiography, first published in 1966 and until now long out of print, the man himself reveals how, after being turned down by his beloved hometown Saints, he went on to form a devastating threequarter partnership with Welsh wing wizard Billy Boston at Wigan’s Central Park. After arriving in 1955, Ashton would captain Wigan for twelve seasons – and win three Challenge Cups among a host of other domestic honours. He captained Great Britain and earned twenty-six caps in an era when the Lions were a powerful international force. Indeed, he led Great Britain to World Cup victory in 1960 and went on the victorious 1958 and 1962 tours of Australia, latterly as captain. Here, in the third in a series of republished Rugby League Classics, his story is retold, accompanied this time by a brand new introduction from BBC commentator Ray French, Ashton’s long-time friend and colleague. An array of photographs and assorted appendices are also included, along with an afterword in which a successful future coaching career and fifteen subsequent years on the board of St Helens are outlined. Eric Ashton MBE died, aged 73, in March 2008. Glory In The Centre Spot is a fitting monument to a man who brought style and grace to the toughest team sport on the planet. “Many people in Wales refuse to recognise the right of any man to capitalise his talents. To hear them talk you would think that as young Augustus John Risman played in the streets of Tiger Bay, Cardiff, he was dreaming of turning professional…” Such were the words of Welsh rugby legend Gus Risman in this, the first rugby league autobiography ever written and, appropriately enough, the first book in Scratching Shed’s Rugby League Classics series. Paperback, 256 pages. “Many people in Wales refuse to recognise the right of any man to capitalise his talents. To hear them talk you would think that as young Augustus John Risman played in the streets of Tiger Bay, Cardiff, he was dreaming of turning professional…” So begins Rugby Renegade, one of the very first autobiographies of any Rugby League star ever written. First published in 1958, Gus Risman’s seminal sporting work long ago went out of print, until rescued by Scratching Shed Publishing Limited as the ideal book with which to open our new series of Rugby League Classics. At the time of writing, Gus Risman’s legendary playing days with Salford, Workington and Great Britain were well behind him. As player-manager of Workington Town, he had led the Cumbrian outpost club to Championship and Challenge Cup glory, and was now embarked upon a new management career at the Willows. In Rugby Renegade, Risman relates a never less than eventful personal story while, in the process, sharing his lively opinions on the current state of rugby league in the late 1950s, and the direction in which he saw the game headed. Along with the original text, this updated edition of Rugby Renegade also contains a brand new introduction written by esteemed rugby league academic Professor Tony Collins; a bonus reprint of How To Play Rugby League Football, Risman’s contribution to the Foulsham’s Sports Library series published in 1938, nowadays almost impossible to find; and the modern-day recollections of Gus’s son, John Risman.